When it comes to edging there are lots of choices – from found & recycled items to cast-in-place concrete curbs. A “best-practice” construction promoted by many sources is to use 8″x8″ hollow cinder blocks. They are durable, reusable and give a nice edge to the vegetable bed that can be used as a bench. (There are several examples in the Community Garden Tour Slideshow.) However, they do best when the garden site has been evenly graded and require careful attention during installation to keep the edges tight. Although the short life-span is a significant disadvantage in using untreated lumber (estimated between 5-7 years), the advantages for ease of assembly and lower cost drove the selection for the initial bed construction. If you have long-term experience (positive or negative) using 2″ untreated lumber as edging for raised beds, let us know. There is still time to consider convincing arguments before materials are ordered. Jackie might be able to give you some feedback. I believe she built her beds out of two inch pine a few years ago. And from the photos on her blog, it does not look treated. Thanks for the link, Alison. That particular post dovetails with my current soil work – I just sent off samples from a couple of soil yards for analysis. Now I won’t have to write a blog about that – I can just refer folks to her write-up. I’ll check with her to see how well her beds have held up. Jackie is expecting about three years of service – that’s significantly less than I was hoping for… must cogitate a bit. It might be possible to solicit cinder block donations from somewhere. Structurally, creosoted timbers (eight by eights) would work really well and are easy to come by for free, but there’s the small matter of the PAHs. (But did you know they use coal tar creosote in medicated shampoos?! Good grief!!) It’s possible that they could be painted to encapsulate the treatment chemicals, and for sure it would be no problem getting donations of oil-based paint – everyone has some in their garage that they’d rather get rid of. Still, that seems like it would be an edging of last resort. I suspect cinder blocks would be the best bet. Has anyone considered adding a coating to the unfinished pine of which the beds are constructed? Maybe even on the outside only if the potential for “contamination” is a concern? It might help it to last a bit longer than three years, and there would be no need to purchase new materials to do this – everyone has unused paint and stains in their garages. Two years ago when we were selling my husband’s house, I did a pour-up of all the old latex paint we had accumulated over the years. It yielded five gallons of the most beautiful grey color. We used it to paint the floor of the loft above his garage. Paints are generally pretty non-toxic these days given that there’s such a potential for young children to ingest bits of them. Titanium dioxide and some polymers. Stains would be better at protecting wood and would look better also. Mostly I think it’s polymers in them, after the VOCs have evaporated off. Thanks for the thoughts Alison. I think the paint would probably help, but I don’t know how much. A big reason to go with untreated wood is that it can be mulched when it out-lives it’s usefulness as a bed edging. What happens when you try to turn latex-covered lumber into mulch? Using left-over paint to protect untreated lumber is cheaper than buying treated lumber, but if it doesn’t win the reuse/recycle argument, I’d almost rather use treated lumber and know that I’m getting a significant increase in longevity. We would have to plan an extra day of work ahead of the build so that the lumber could be painted and dried before the build-day. And we might not need to mix the paints – I know some folks who would like to see rainbow-colored garden edging. It’s not my thing, but I could eventually learn to ignore the hideous, un-natural, non-neutral color-scheme. Do you think it’s worth the effort? Each bed will have about 100 sq-ft of paintable edging, so minimum of 1000 sq-ft or about 3 gallons of latex paint (assuming a single coat). We would schedule delivery of the wood a week early and have an extra volunteer day – kids could easily help with this one (assuming we’re not using high VOC paints/stains that could trigger reactions). I don’t have a strong feeling about paint/stain either way, but here’s a related thought: If the ability to ultimately mulch the bed edging is a priority, why not acquire some downed tree trunks (cut logs) instead of spending a bunch of money on untreated lumber? 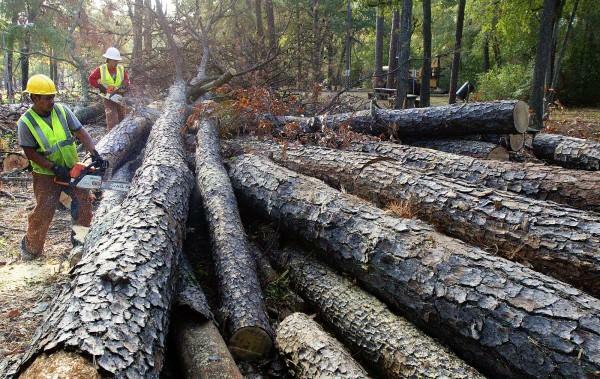 Houston has lost millions of trees in the drought, so there are millions of dead trees of sufficient diameter potentially available to use as edging, pine trees in particular. There are so many dead trees that mulchers can no longer accept them. These guys must be making a killing financially – they accept dead trees at no cost to them for either the trees or the transportation, and then sell the resulting mulch at about four bucks a bag! I buy my garden supplies at Living Earth. About two weeks ago there was a sign posted on their door warning contractors that they could no longer accept any trees for mulching because they are up to their eyeballs in mulch already stockpiled. That suggests to me that a lot of these trunks will need to go to landfill instead, which is a horrible waste of a good resource. Got chainsaw?? Go in search of fat pine logs. Find a property owner and ask if you could do them the favor of clearing a few widowmakers. Then haul them back to BAUUC for the beds. Alison – Here’s the image you sent to me. It certainly is sobering to think of all the trees lost from the drought – both as living trees, habitat and lumber resources. I would support using logs for edging the naturescape areas – these logs would only need to be 4-6 inches in diameter and don’t need to be as straight. The Mennonite Church in Houston, 1231 Wirt Rd, 77055, put in 2 X 10 beds such as you describe last year. I’m sure that more people know how to do wood construction. The cement blocks are just sent down on the existing dirt and filled with the purchased dirt. I don’t think that even ranks as construction. Having to level the existing dirt is a problem but one that using wood does not solve. All four sides of the bed still have to be level. If slope causes a significant gap at the bottom on one end (it did for the Mennonites) be ready with some bricks or blocks to stuff in there it keep the dirt from coming out. As far as mulching is concerned, the old timber can be mulched but will it be? I don’t think so if there is no mulching machine handy. But even if it just lays around and rots it is non-toxic, unlike treated lumber. In the current application I am only making one bed so I plan to use cement blocks of some sort. It would be neat if you could make one small bed with landscape stone. Church members might more readily copy this in their home gardens and start growing vegetables too. Thanks for your comments Nancy. I might check in with the Mennonite church to see how well their beds are holding up. We did experience the problem of gaps in the bottom of the bed (you can see pictures in this blog post). We cut some scrap plywood to cover the gaps and hold in the soil. And every couple of years we wind up renting a large wood chipper to mulch trimmings from the property, so I expect that’s when we would mulch any rotten lumber.